KODI had a good signal on the top of the hour at 0600 on October 23, and I recorded their legal ID with little or no interference. Friendly and detailed email from Director of Engineering Charles Dozier last night confirmed my reception. Dozier sent along an audio file and a jpg of the 1-kW transmitter. Legend Communications of Wyoming owns KODI along with four other Cody stations plus stations in Gillette and Buffalo. Dozier sent some very interesting read about how the Cody studios were built and equipped. La B Grande is a common guest here, and when propagation goes "deep" it has the ability to reach excellent signal levels, at which times it's really a joy to listen to. I haven't really tried hard to get it verified until recently though, but last night I received a friendly email from Gerente Jesus Flores. A good evening for QSLs! Email from Jeff Caves at KBOI/KTIK Sales confirmed my October 11 reception of KTIK today. For some reason I've had a bit of trouble hearing KTIK although it is not at all uncommon with its ESPN programming. Many, many years ago KTIK was on 1340 and I heard them once then. Heard a few times in October. Friendly email from Bill Meyers this evening who writes: So glad to know that there are folks like you prowling the night waves trying to search out all we lower-powered broadcasters on the band. Well if that isn't inspiration to keep us going, nothing is! For the statistics freaks (there are some around): KMED was mediumwave verification no 450 from the USA (not counting Hawaii). I heard KWNA briefly on October 14; they had a sportcast and threw in a casual ID before commercials. Very friendly email on Sunday evening from News Director Eric Skye who could inform me that what I heard was a play by play for local High School Basketball. My 75th Local Channel (aka Graveyard) verie. List 4 of 4 from the KONG15 DX-pedition. Many unidentified stations need attention, but here are the last of the ID'ed ones. Dates in dd.mm format, times UTC. For once a good and clear signal from "Newstalk 780 KOH" on October 24, otherwise 780 is dominated by CFDR, WBBM or KNOM, depending on conditions. When conditions go "deep" though, KKOH is there despite its difficult nighttime pattern. Detailed email from PD Dan Mason today. Friendly email from Cal Hunter at KBLF confirmed a very good quality reception in October - one of those rare instances when a station actually fades up when it's time for identification. Red Bluff is half-way between Chico and Redding on the Sacramento River. Redding's KQMS 1400 had a good signal at the same time by the way, so NoCal was getting out well that day. Brief email from Edmund W. Cavagnero last night confirmed my October reception of KCBS. Interestingly enough, in a period with good signals from California KCBS was heard with excellent strength above CBC Edmonton despite their extremely unfavourable signal pattern (most of the signal goes South-Southwest). KNBR 680 also audible although only tentatively. List 3 of 4 from the KONG15 DX-pedition; I still have some unattended recordings from my NRD-525 to check out. As usual, only the interesting stations are listed, regular ones not. Sorted by frequency. Date format dd:mm; time is UTC. Email from Alan White today confirmed my October 19 reception of KACH. Weak signal at the time, and difficult to hear as Mr. White pointed out but he could pull out the call and location from the full-hour ID I recorded. Possibly the best New Zealand station I heard during KONG15. The story goes like this: At 1231 UTC on October19 I was searching the band for North Island stations. When I came to 783, I heard BBC World Service, and I soon found out it could be Access Radio. I found their webstream, and it was evident that it was the same edition of the World Service. I followed the webstream up to 1300 and did hear an Access Radio ID on the stream. Difficult to follow both the receiver audio and PC audio though, so for quite some time I wasn't sure. When I went through the recording just before the hour I heard...nothing! Only the BBC WS ID and news. A few weeks later I decided to check again. Very strange, at 1259 there was indeed a distinct "Wellington Access Radio" identification! I don't know what I missed the first time. Maybe I listened too close to the full hour. I sent an email report to Access Radio in January and apparently they did reply but it never arrived at my inbox... so I made a follow up request which landed a prompt response from Station Manager Kedron Parker. Access Radio was the first of 11 community radio stations when it was established in 1981. They relay BBC WS from 1.00 to 5.00 am local. During the day they broadcast in English, Samoan, Tongan, Cook Island Maori, Vietnamese, Tokelauan and Hindi. They were (presumably) heard very briefly also once during KONG16 at the end of October. Now that we know that they're there, it might be easier to hear them again. But 783 has awful interference especially from China. You really have to be at the right spot at the right time! KCJJ and KRND aren't easy to get past, they seem to dominate here whatever kinds of conditions I have. ID'ing KKGM has taken some effort, but on October 23 I finally heard KKGM alone for a few minutes. As luck would have it, the ID came less than a second after I had started the recorder! Friendly email from PD Jack Davis this evening confirmed my reception. I worked hard to find a subject line...I know it isn't good. I wonder which Google searches will end up here now. Anyway, I took this picture today of my radios. Which isn't quite true because the NRD-525 and R-390A aren't in it. On the top: The Eton E1. A great surprise both with sensitivity and audio quality, although it lacks some tools for getting rid of noise and hets. And a cold radio in a cold room is 180 Hz off! Bottom, from left: The IC-703. Excellent radio but the stock AM filter is a disaster. Replace that, and you have a super SW receiver. Remove the MW attenuation, and you have a super receiver... The keypad belongs to the IC-703. Next: Two IC-746Pro's. Outstanding performers, but MW sensitivity was crippled. That resolved, they are hard to beat. A small downside that the three AM bandwidths are fixed and not continously variable. A very, very small downside. Far right: IC-7000. Actually it doesn't need modification; it is excellent from stock. 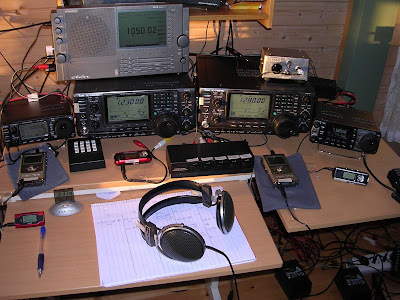 In fact, in some cases it fights interference even better than the IC-746Pro. Audio and line-out is fed via the Elliptic Lowpass Audio Filter (ELPAF) which stands on the rightmost 746Pro. Center, front: A 1:5 audio distributor I found on Ebay. It was very cheap, and after a few months of use, I am beginning to understand why. Wear & Tear. I got the clock for free from a mail-order firm. Its accuracy reflects its value and it is hopelessly difficult to correct. OK weather though a bit windy and quite cold but with the low K-indices I thought I'd drive to Kongsfjord and try a bit. Conditions were mediocre, mostly westerly, but a surprising ID came at 0800 UTC when KVOC Casper WY 1230 surfaced long enough. Otherwise, KUTI Yakima WA good on 1460, San Francisco as usual on 1550 and a C&W station on 1360 which is a little intriguing, maybe KOHU Hermiston OR? Later on the usual dominant KKMO took over. On 1050 I heard Fox Sports, possibly KTCT San Mateo CA. Need to check on recordings later. By 1100 UTC only the stronger Alaskan stations were left. Friendly email from Skip Dillard tonight confirmed my December, 2006 reception of WCHB. Good quality at the time. Although they have a News-Talk format as indicated by the logo above, at nights they play a very nice mix of Soul, R&B music. Tnx OJS for the email address. Received this from NZ DX-er Bryan Clarke today - a story from NZ-based newspaper Indian Newslink. Bryan helped me obtain a verie from Radio Tarana, Auckland 1386. Interesting to see that they found it worthy a mention in the paper as well! Not the easiest kind of paper to scan and make a jpg of, but I hope it is readable.